Review: "Fredrik Thordendal's Special Defects: Sol Niger Within (remastered)" - Sea of Tranquility - The Web Destination for Progressive Music! For those who have been living under a rock for the past decade and a half, Fredrik Thordendal is the lead guitarist for Swedish technical extreme metal act Meshuggah, and Sol Niger Within is his 1997 solo debut, now being reissued and remastered by Metal Mind Productions. Ironically, he's yet to do a follow-up to this one, but then again, his main act has certainly kept him more than busy enough over the years. Sol Niger Within is certainly going to be an acquired taste for some. It's not by any means all that similar to Meshuggah, though there are moments of beefy, off-kilter riffs & rhythms that will remind some of the Swedish juggernaut, and Thordendal's snaky, Allan Holdsworth inspired lead work is all over the album, but his Special Defects project is completely avant-garde in nature, sprinkled with death & black metal, jazz-fusion, electronica, and prog rock. Much of the lyrical content of the album deals with UFOs, the afterlife, and the end of the universe, and seeing that there are 29 short tracks that comprise Sol Niger Within, it almost plays like one long concept piece. It's about half instrumental, and half featuring vocals, with the vocal pieces including a combination of spoken narration, black metal shrieks, screams, and growls. Thordendal's guitar work is stellar as always, as he combines thunderous, technical riffs and blazing jazz-fusion solos throughout the album. The list of guests here is too lengthy and numerous to mention, but they help out on drums, bass, keyboards, sax, and vocals. Unless you can truly appreciate avant-garde metal, Sol Niger Within is going to be a noisy, disjointed affair for you. 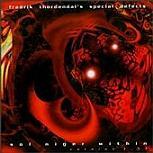 However, if you have an open mind, there's a good chance this wildly experimental 1997 offering from Meshuggah's Fredrik Thordendal will find a permanent home in your CD collection. Metal Mind has done a great job remastering this for premium sound quality, and there's an essay about the album to go along with a booklet filled with lyrics and info about the songs that make up the album. Well worth seeking out of you somehow missed out on this one 13 years ago.